As an Iglesia Ni Cristo member, I was overwhelmed by the news that I want to blog it immediately after reading the article. The Korea Herald reported that Hanwha Engineering and Construction Corporation began the construction of the worlds' largest domed arena in north of Metro Manila, Philippines. 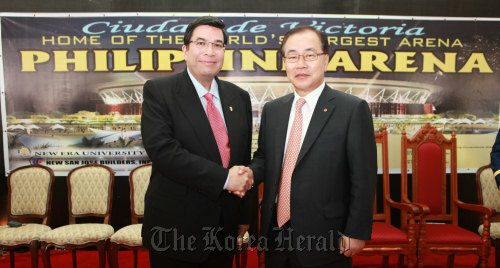 The $175 million dollar contract was signed last August 14, 2011, in a ceremony attended by Hanwha E&C officials including Vice Chairman Kim Hyun-Chung and Iglesia Ni Cristo Executive Minister Eduardo V. Manalo. Hanwha E&C said that the work will be carried out over 30 months to be finished early 2014.
sa Diyos ang lahat ng kapurihan! ay anonymous ka, thank you din po. sino po ito? yeah, I can't wait for 2014 Centennial Celebration! To God be the Glory!